The local inhabitants of Wanchese call it "Thicket Lump", a name at once remarkably specific in its description and quite ignominious in the lack of recognition of the origin point of a local tradition. The ignominy is not intended, however, for the Tillett site, or "Thicket Lump", today is nothing more than a drowning, remnant hammock supporting a thicket of yaupon and cedar surrounded by marsh, and hardly anyone would recognize it as the first known fishing community at Wanchese. Nevertheless, some 1500 years ago, when sea level had risen sufficiently to create the saline sounds and marshes around the south end of Roanoke Island, people of a culture previous to our own took advantage of this hammock beside the marshes and began to fish in the sounds and collect oysters and other shellfish from nearby beds. Thus began the traditional livelihood associated with the community of Wanchese, a dependence on fishing that has endured through at least two different cultures and has recently achieved a high point with the planned development of a major fishing port and seafood processing facilities. This report presents the results of an archaeological investigation of the Tillett site and the Native American cultures that occupied it during its first 1100 years of existence. It is perhaps appropriate that the archaeological research at this first fishing community was stimulated by the expansion of Wanchese Harbor to enhance further development of the modern fishing community. The Tillett site is also interwoven with other aspects of Roanoke Island history. The last Native American inhabitants of the site were probably members of the Carolina Algonkian Roanoke society, the same people whom the first English explorers visited on Roanoke Island in 1584. The Roanokes also figured prominently in relations with the English colonies of 1585 and 1587 established near what is now Fort Raleigh on the north end of the island. When the first museum was completed at Fort Raleigh it was artifacts and other material excavated from the Tillett site that were installed in the displays typifying the Carolina Algonkian culture. It is thus appropriate that the site be recognized for its contributions to knowledge of 16th century and earlier Native American culture during America's Four Hundredth Anniversary celebration. Wanchese is the southernmost of two long-established communities on Roanoke Island, Dare County, North Carolina (Figure 1). The history of the community begins in the late 17th century of the Colonial Period, when it was probably first settled. Until 1886, when the first Post Office was established, the community had been known as "the lower end" and the name "Wanchese" was selected for the Post Office. In his summary history of Roanoke Island and its communities, David Stick (1958:317) points out that commercial fishing has been an important economic factor in Wanchese since the 19th century. In the (Page 1) earlier years, there is no doubt that small subsistence farms and the keeping of domestic livestock supplemented fishing but modern technological developments and efficient transportation and redistributive systems in the coastal region of North Carolina have caused the demise of these supplementary subsistence activities. The continued development of commercial fishing at Wanchese had in recent years exceeded the capacities of the small, sheltered harbor dredged out of the mouth of Mill Creek in the 1950's, and the U. S. Army Corps of Engineers developed a project which included enlarging and deepening of Wanchese Harbor and improvements to the channel from Shallowbag Bay in Manteo to Oregon Inlet. While this project was in the planning stages, the North Carolina Department of Natural and Economic Resources formulated a plan to develop a seafood industrial park facility at Wanchese dependent upon a harbor of adequate depth and size to accommodate facility users. Because of this need, the dredging and enlarging of Wanchese harbor was begun in 1979, ahead of other segments of the overall project (U. S. Army Engineer District, Wilmington 1977). 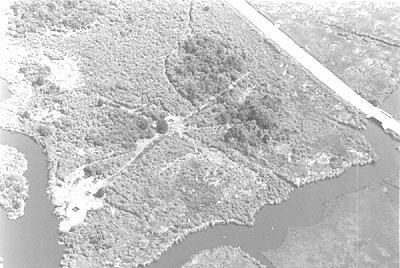 An archaeological survey of the Manteo-Shallowbag Bay project area, including Wanchese harbor, conducted for the Corps of Engineers had identified no archaeological or historic sites that would be primarily impacted by dredging or harbor construction (Phelps 1977). However, in that report the Tillett site (31DR35), south of Wanchese, was listed as an archaeological resource which might experience secondary impact resulting from the anticipated general expansion and development of Wanchese in response to the expanded harbor and the proposed seafood industrial park. Based on that recommendation, the Archaeology Branch, North Carolina Division of Archives and History, recommended to the Department of Natural and Economic Resources that funds be provided for salvage archaeology at the Tillett site. The modern community of Wanchese is situated on an elevated hammock on the south end of Roanoke Island, extending westward to Croatan Sound, eastward to Roanoke Sound and the harbor which occupies the former course of Mill Creek (Figures 1 and 2a), and south where residential areas extend to the edge of the marshes. The Tillett site is located on the north edge of the marshes, approximately 1800 feet south of the harbor (Figure 2a) and west of State Road 1141 just before it crosses Great Gut. The road continues to its end at the southernmost high ground presently occupied by the Davis Boatworks. The road, Great Gut, and remnant hammock area of the Tillett site are seen from the air in Figure 2b. The first known historic reference to the Tillett site appears on an 1861 U. S. Coast Survey Map, which designates the site as "Indian Shell Banks" (Frontispiece). At that time the property was probably owned by the Daniels family, and the tract which contains the Tillett site was sold by Spencer Daniels to Edward C. Green in 1884 (Dare County Register of Deeds, Book B, page 160), who then moved his family from Bodie Island and built a house on the property. According to family members, the house probably occupied the highest part of the remnant hammock. The land was still in the ownership of the Green family when Talcott Williams visited the site in 1895 as part of his investigation of Indian sites and the site of Fort Raleigh on Roanoke Island stimulated by events marking the Tricentennial of the Roanoke voyages and the first English colony in America. Williams mentioned the site among four recent Indian villages he had examined on the island and described it as ... "one at the southern end, where extensive shell mounds have been reduced in extent by their use as an easy fertilizer, but on which a clearly marked mound 600 by 200 feet in size fronts on an old canal or waterway cut through the swamp for a mile" (Williams 1896:54). During a 1980 project related to gathering background on Carolina Algonkian sites and culture, extensive inquiries and searches for Williams' field notes in the hope of locating additional information on this and other sites was made to no avail. Even in a quite detailed biography of Talcott Williams the only mention of his Roanoke Island work is essentially the same passage as found in his own 1896 report, except that the reference to the site we now know as the Tillett site is missing from that passage (Dunbar 1936:235). Williams' reference to the borrowing of shell from the Tillett site to use as field lime, or fertilizer, a common practice in the coastal area of North Carolina, makes it obvious that local residents were aware of the site. The borrowing was unfortunate in that it removed most of the upper midden and with it most evidence of the last prehistoric occupation of the site. The Green family residence was torn down sometime between 1910 and 1920 but ownership of the property remained with that family when (Page 4) Paul Green, famous author of the outdoor drama "The Lost Colony", and Ben Dixon MacNeill opened excavations in the Tillett site in June, 1938. The purpose of their work was to obtain information on the "Indian civilization" of Roanoke Island and to secure specimens for interpre- tations of Indian culture in the newly constructed museum at Fort Raleigh. Their excavations reclaimed fragments of pottery and parts of a human skeleton from the site, and the newspaper account also reported ... "that it was hoped that these explorations may become the basis for a general scientific study of Indian habitation throughout the area from Currituck to Buxton and that a complete examination of Indian burial mounds may lead to the establishment of the foremost museum of Indian life in the world" (Dare County Times 1938). It is unfortunate that this noble purpose was never carried through, since many of the sites of Indian culture on Roanoke Island and other places have now been destroyed by man and nature. In 1971 the land was sold by the Green family to Gilbert R. Tillett, whose permission we sought to conduct test excavations at the site in 1972. These tests were part of the student training in the East Carolina University summer field school in archaeology conducted on Roanoke Island and adjacent areas that summer. One of the primary research goals of the field school was to relocate and test sites reported by Haag (1958) in his survey of the locality, and to identify any previously unreported sites. 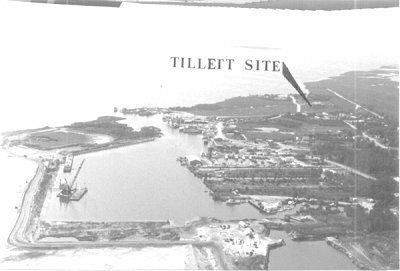 The Tillett site fell within the latter category, since Haag did not visit or report the Tillett site in his 1955-1956 survey, although he was certainly aware of the location, having cited Talcott Williams' article in his published references. Approximately one week was spent on the site in 1972, during which time a reference point was established, preliminary mapping begun and two test squares were opened. Test square A in the vicinity of Great Gut canal was excavated to a depth of 1.1 meters, but only one 10-centimeter level was excavated in a second square, B, prior to the end of the field school period which required closing the site. Test A confirmed the existence of two cultural components and some remaining stratigraphic context as well as exposing massive disturbance from previous digging. It was the information from these tests that formed the basis of the recommenda-tion for excavation because of secondary impact in the 1977 report to the Corps of Engineers. While working the site in 1972, we were informed by the owner that he planned to develop the property as soon as he could. While this plan had not come to fruition by the time of our 1979 project, the owner had bulldozed large areas of the site in 1974, further reducing the stratigraphy and deepening the areas of disturbance. Even with this last damage to the cultural content of the site, sufficient information has been reclaimed to understand its plate in history. Roanoke Island is a remnant ridge which was part of the mainland during the lowered sealevel of the Wisconsin glacial stage, and gradually assumed its island characteristics as sealevel rose in (Page 6) Holocene times, drowning the older drainage systems and the lower elevations of former mainland (Riggs and O'Connor 1975). As such, the island has a different developmental history than that of the barrier islands (Outer Banks), which were generally formed within the past 2000 years. Similarly, the archaeological evidence of human presence on Roanoke Island should extend farther into the past than that found on the more recent barrier islands. While no detailed study of the Wanchese locality on the south end of Roanoke Island has yet been accomplished, information from local informants and preliminary studies of local collections obtained in and around Wanchese indicate occupations during the entire Archaic period, 8000-1000 B.C. (Table 1). Archaic period evidence has also been found at other sites (31DR36, 49) on the island (Phelps 1977: 61-62). During that time the island was still connected to the mainland, and only after sealevel had risen sufficiently to create the island and form partly saline sounds was the way of life observed at the Tillett site possible. Three components, or temporally and culturally distinctive occupations, were identified at the Tillett site. These are the Mount Pleasant component, beginning around A.D. 400 and ending around A.D. 800; the Colington component, the prehistoric manifestation of the Carolina Algonkian culture, from A.D. 800 to A.D. 1650; and an Historic period component resulting from the Green family use of the site from ca. A.D. 1884 to 1910/20. 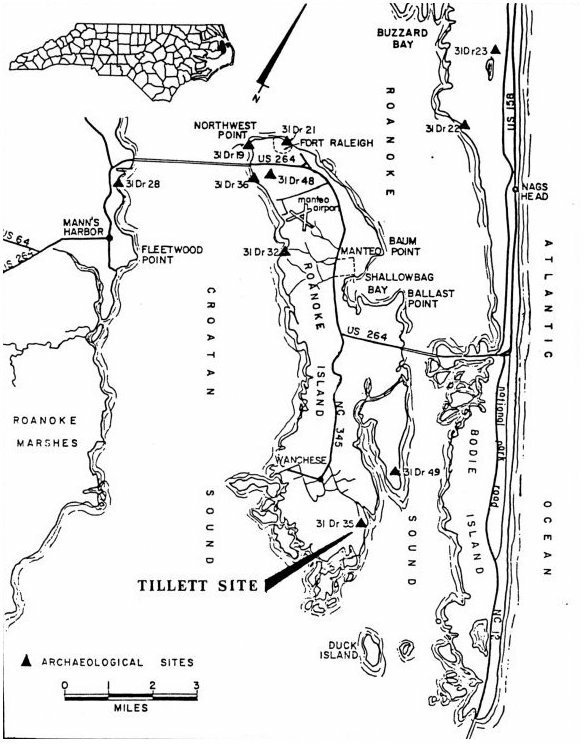 During the first two components, the Tillett site appears to have been a seasonal settlement to which people from the mainland came to fish and collect shellfish; the Historic component is probably best classified as a small, family farmstead with an additional emphasis on fishing activities. 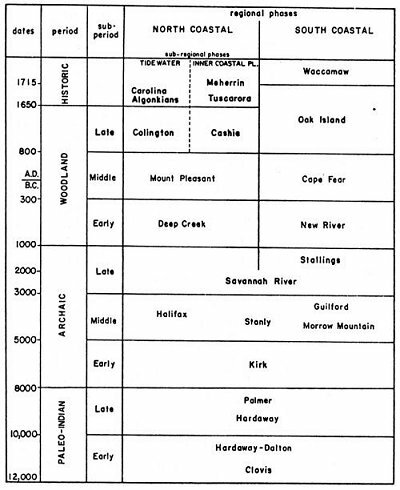 In the recently defined cultural-historical sequence for coastal North Carolina (Phelps 1983), the two prehistoric components, Mount Pleasant and Colington, belong in the Middle and Late Woodland sub-periods, respectively (Table 1). While the Middle Woodland sub-period is assigned a beginning around 300 B.C., it was not until A.D. 400 that the Mount Pleasant occupation of the Tillett site began. The A.D. 400 date reflects a beginning point in the continuum of environmental change when the type of subsistence and exploitation activities in evidence at the Tillett site were first possible at this location. The Colington component continued these activities from A.D. 800 onward. While it is presumed that the site was utilized throughout the Late Woodland (Colington phase), we cannot be certain because of loss of the entire top of the Tillett site by shell borrowing and subsequent land modification. The reclaimed evidence relates specifically to the early Colington component, but it is quite probable that occupation of the Tillett site was at least partially contemporaneous with Colington phase sites at Northwest Point (31DR19) and near the Elizabethan Gardens (31DR21) on the north end of the island (Figure 1) (Phelps 1984: 19-22).